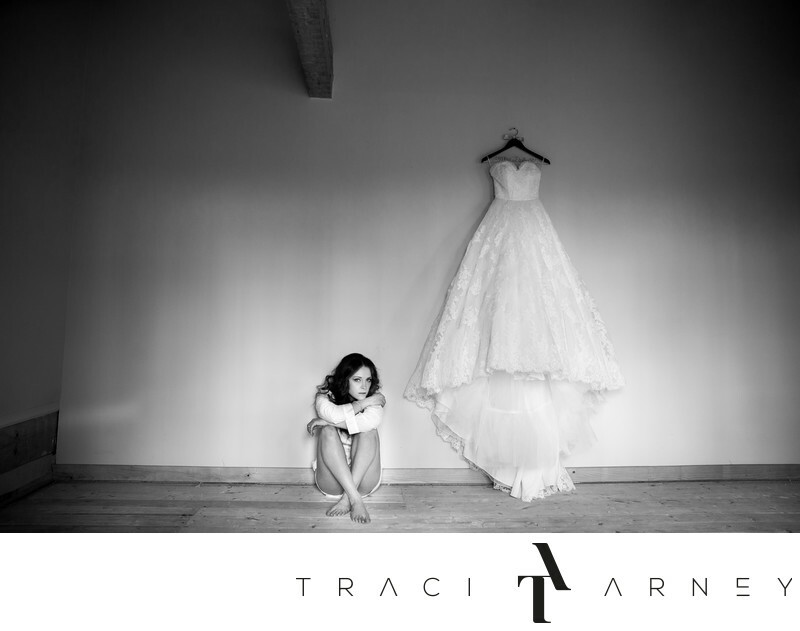 Who knew that an empty room, a wedding gown, and a ballet dancer could make for such a powerful image? Jaimie was my very first brave bride and when we discussed where to do her bridal session, she said the sky’s the limit. She and her fiancé had just moved into their first house near Roanoke VA and the upstairs wasn’t even furnished yet but the blue blank walls, the beautiful hand carved beams and that gorgeous afternoon light flooding into the room made for an incredible beginning shot for the day. I asked Jaimie to hang her dress on the sole nail on the wall and to sit down beside her gown on the hand hewn wood beam floors. As a dancer, she exuded such grace with a beautiful, peaceful and solemn look that has always been one of my favorites. It is also a favorite of many subsequent brides and grooms. It is a simple, quiet, and very elegant portrait of a bride just before she gets dressed. Jaimie and Nathan purchase this house specifically because of it’s handmade qualities so it was important to me to capture an image that showcased some of these qualities. I chose black and white because of the age of the home. With the amount and quality of afternoon sunlight flooding into the room, there was no need for any additional lighting. Jaimie glowed already. Because of the size of the room, I chose to use my 24-70mm lens at 24mm. It allowed me to show the full scope of the room including the floor to the ceiling and as much of the width of the room as I could. I could have used a wider lens but then I would have had to contend with lens distortion and since this image is about architectural structure, I didn’t want to do that. Jaimie and I have had a special connection since our very first meeting and we are dear friends now. Something happens when a bond of trust builds between two people. Images are better because of that trust and friendship and life is better in general. Location: 136 S Ridge St, Danville, Virginia, VA 24541. Keywords: At Home (21), Black and White (135), Bridal Session (210), Empty Room (6), Jaimie (15), Pronovias (12), Roanoke (6), VA (42), Virginia Wedding (6). 1/50; f/2.8; ISO 320; 24.0 mm.